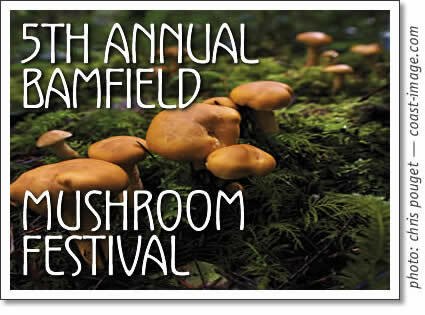 Mushroom aficionados and wild mushrooms newbies alike, won't want to miss the 5th Annual Bamfield Mushroom Festival, a treat for all ages. Last year's event was a roaring success! Mark your calendars. Bamfield's annual celebration of all things fungal will be held on Saturday October 13th at the Community Hall in East Bamfield. The hall will open at 9 am. Start your day with a scrumptious berry pancake breakfast served from 9 am until noon. The mushroom identification table featuring a wide selection of local fungi (an education in itself) will also be open for viewing. Those who wish to learn more about mushrooms, edible and otherwise, can join Mushroom Expert Jim Jones at 11 am and 1 pm for Guided Mushroom Forays through the local forest. Children (being closer to the ground) are some of the most successful mushroom hunters. Participants will be briefed on common local mushrooms and given the opportunity to go on own their own hunt, and have their specimens identified by Jim. Feel free to bring any mushroom you're unsure of from your own wanderings or back yard. Any mushroom gathered locally on the day of the festival is eligible to be entered in the Mushroom Derby Weigh-in is at 3 pm. There are wonderful prizes for the biggest mushroom in a variety of categories, however anyone who enters a mushroom is eligible for bonus prize draws as well. For the culinarily inclined there is a mushroom cooking contest, edible mushroom only of course. Dinner! The best part. A few of Bamfield's finest cooks will be preparing a feast featuring a variety of local wild mushrooms and other delectables. This will be followed by one of Jim Jones' entertaining slide shows. By the way, Jim is always looking for new material to add, so if you have any mushroom photos or Mushroom Festival photos from previous years, please email them to jtjones@uniserve.com. Finally, the evening wraps up with the famous annual "Toasdstool Stomp", a dance, featuring a live band. A package for ferry transportation & events is available through Seaway Express. It includes return transportation from Ucluelet through the Broken Group and most festival events. For information and reservations please call (250) 726-5353.